What is Waiver of Tuition? Waiver of Tuition is a state program (NE R.S.S. 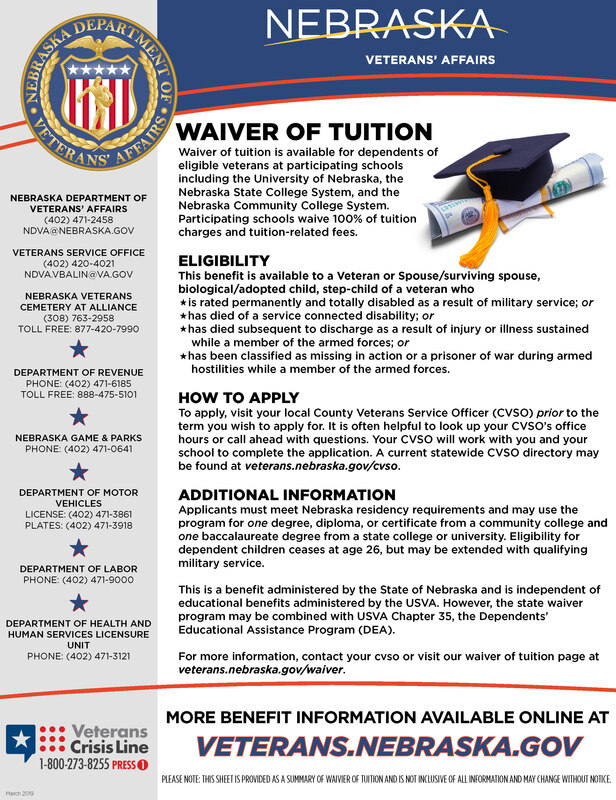 80-411) available to dependents of an eligible veteran that may be used to waive 100% of a student’s tuition charges and tuition-related fees to the University of Nebraska campuses, Nebraska state colleges, and Nebraska community colleges. Waiver of Tuition can be used to receive ONE degree, diploma, or certificate from a community college and ONE baccalaureate degree from the university or a state college. If the student wishes to take full advantage of the Waiver program, the degree, diploma, or certificate must be earned before the baccalaureate degree. Once a baccalaureate degree has been earned, the student is no longer eligible to receive Waiver; there are no extensions or exceptions to this rule. Please Note: Waiver of Tuition is not available for masters, doctoral, or professional degrees. Waiver of Tuition does not cover non-tuition-related fees, housing or food costs, parking fees, etc. The student is also responsible for purchasing any necessary books and materials needed for their courses. If a student would like to inquire into what charges and fees will be waived, they should contact the school. Which Schools Participate in the Waiver Program? Who is Eligible to Receive Waiver? Please Note: The rating decision date, date of death, or classification must be prior to the start of the term being applied for to be eligible for that term. The student must be a Nebraska resident and enrolled in one of the participating schools, meeting that school’s residency requirements1 for paying in-state tuition. A child dependent will be eligible to receive Waiver of Tuition until a baccalaureate degree has been earned2 or until they reach 26 years of age. An extension may be available if the student served on active duty with the armed forces after their 18th birthday but prior to their 26th birthday. In that case, the student’s eligibility for Waiver will end 5 years after their 1st discharge from active duty. The extension will not exceed past the student’s 31st birthday. A step-child dependent, while their biological parent is still married to the veteran, will be eligible to receive Waiver of Tuition until a baccalaureate degree has been earned2 or until they reach 26 years of age. An extension may be available if the student served on active duty with the armed forces after their 18th birthday but prior to their 26th birthday. In that case, the student’s eligibility for Waiver will end 5 years after their 1st discharge from active duty. This extension will not exceed past the student’s 31st birthday. 1 In order for a student to receive a Waiver of Tuition, they must meet the Nebraska residency standards for in-state tuition. NE R.S.S. 85-502 defines the minimum requirements that individuals must meet in order to be eligible for in-state tuition. If there are any questions regarding residency requirements, the student should contact the appropriate school. If the student hasn't met the appropriate school's residency requirements, they will experience a delay in receiving Waiver until the requirements have been met. 2 Schools have the right to suspend or terminate a student's Waiver if the student does not meet the school's "Standards of Academic Progress" or similar policies and standards. How Does a Student Apply for a Waiver of Tuition? Applications must be submitted in time for proper processing and certification prior to the beginning of any school term. The Nebraska Department of Veterans’ Affairs cannot be held responsible for any delay not attributable to our processing of the application. If you have never applied for Waiver of Tuition before. If you have been awarded Waiver but have missed a term, other than the summer term. If you have been awarded Waiver to one school and now want to receive Waiver at a different school. If you have been awarded Waiver to one school and want to take additional classes at another school (Simultaneous Waivers). You should be enrolled in a degree program at one of the participating schools and registered for classes. A copy of the veteran’s DD Form 214 (discharge record) showing Character of Service, such as Honorable or Under Honorable Conditions. Divorce decrees may be needed to prove the veteran is no longer married to a previous spouse that was receiving Waiver of Tuition. Copy of a Marriage Certificate on file with Vital Statistics (or a similar agency) proving the student’s marriage to the veteran. Copy of a Birth Certificate on file with Vital Statistics (or a similar agency) listing the veteran’s name as a parent. If the student was born abroad, a Consular Report of Birth Abroad listing the veteran’s name as a parent can be obtained from the US Department of State. Please Note: Hospital memorabilia birth certificates will not be accepted. If the child dependent was adopted, provide an adoption decree proving the veteran’s adoption of the student. Copy of a Birth Certificate on file with Vital Statistics (or a similar agency) listing the biological/adopted parent’s name that is married to the veteran. If the student was born abroad, a Consular Report of Birth Abroad listing the biological/adopted parent’s name can be obtained from the US Department of State. Divorce decrees may be needed to prove the veteran is no longer married to a previous spouse that was receiving Waiver of Tuition for themselves and/or step-children from that marriage. Download the Waiver of Tuition Application (NDVA Form 3, pages 1-2) from our website. It can be filled out on the computer, printed and signed. → Coming Soon!! When filling out the form, please print legibly. There may be delays in processing if the application is illegible. Visit the school you are enrolled at to have Part VI of the application (NDVA Form 3, page 3) completed by one of the school’s Authorized Representatives. If this form is completed by someone other than an Authorized Representative, expect delays in processing. Once all 3 pages of the Waiver application have been completed and signed, and all necessary supporting documentation3 has been gathered, it is time to submit the application packet to the Nebraska Department of Veterans’ Affairs for processing. Disclaimer: Due to the sensitive information contained in the application packet, students should email at their own risk. 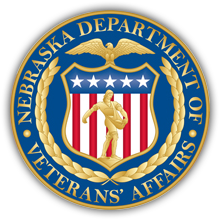 The Nebraska Department of Veterans’ Affairs cannot be held liable for any compromised information submitted by email. First time applicants should expect approximately 4 to 6 weeks for applications to be processed, as information regarding the veteran’s VA Rating must be requested from the US Department of Veterans Affairs. Some instances may take longer. Applicants that have previously applied for Waiver of Tuition should expect 1 to 2 weeks for applications to be processed. Please Note: Further information may be requested from the student; processing times can be drastically effected if the student does not respond in a timely manner. Decision letters will be sent to the student by email or postal mail. Students should maintain copies for their files in case any issues arise. The school at which Waiver of Tuition is being requested will receive notification of the Department of Veterans’ Affairs decision on the application. 3 If you have previously applied for Waiver, submitted the required documentation, and no changes have occurred, you will not need to resubmit this information.